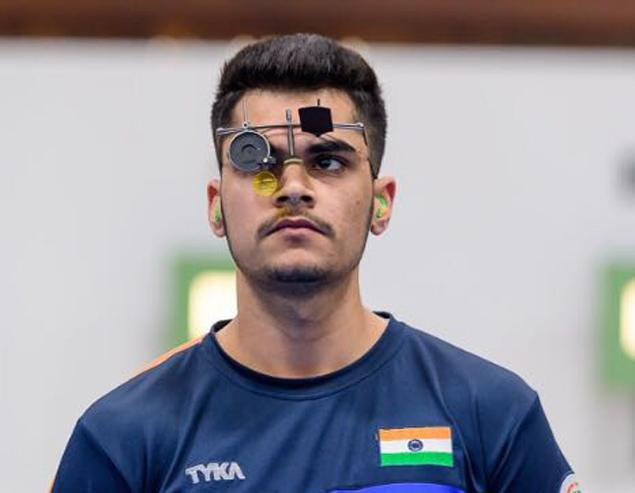 CHANDIGARH: Punjab lad Arjun Cheema, a 17-year-old shooting prodigy from Mandi Gobindgarh, and Haryana’s Anmol Jain, a 20-year-old marksman from Faridabad, helped India win the team gold in the 50 metre free pistol event in the ongoing ISSF Junior Shooting World Cup on Sunday. Gaurav Rana, who represents Air Force in national championships, was the third member of the Indian team. The championship is being held in Suhl, Germany. India clinched five medals – two gold, one silver and a couple of bronze medals – on the day. Besides the team gold, Anmol also bagged a bronze in the 50 metre free pistol individual event with a score of 549. The women’s team comprising Neha, Devanshi Dhama and Anushka Patil also gunned down the team gold in women’s 50 metre free pistol event. Neha also won the silver in women’s 50 metre free pistol individual event, while Devanshi had to settle for the bronze. She trailed Neha by a solitary point. Neha’s cumulative score was 528 — just 2 points behind gold medal winner Yulyana Rohach of Belarus. In only his second world cup, Arjun has been in scintillating form this year. He helped India to a team gold during the ISSF Junior World Cup in Sydney, earlier this year. Arjun is also an ace swimmer, and had represented the country in an international junior swimming championship in Austria in 2014. Seeing little scope of progress in swimming in the country, Arjun gave up the sport and turned to shooting. However, his school timings weren’t suitable and was affecting his shooting career. So he joined a private school in his hometown in order to focus on his game. “Shooting requires stern focus and hours of practice which was not possible in his previous school. We even constructed a 10 metre shooting range at home for him,” Arjun’s father, Sandeep Singh Cheema told TOI. Arjun’s grandfather Sardar Balwinder Singh was a member of the Indian football team, while his uncle Jagwinder Singh Cheema holds an Asian junior powerlifting record. Therefore, his family wanted Arjun to continue the sporting legacy. So when he took up shooting, his family backed him entirely. “I have personally accompanied him to all the national tournaments,” said Arjun’s father. Arjun started shooting in 2015. During a national tournament in 2016, he came in contact with Hollinder Singh – a cop with the Chandigarh Police and a shooting coach. Presently, Arjun has two coaches – Hollinder who trains him for the 50 metre events and Parvez Joshi who hones his skills in the 10 metre events. “When I took him under my wings, he immediately showed signs of being a good shooter. He showed improvement in just a few months, hitting the bull’s eye more often than not. When he is in the zone, he can beat even the world champions,” said Hollinder.